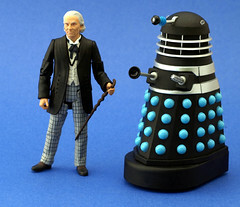 Comments: For the 2009 San Diego Comic-con Underground Toys offered 4 2-packs from their Doctor Who Classics line. These packs were the 1st Doctor with a Dalek or the 2nd Doctor with a Cyberman. Each of these packs came in your choice of color (pictured) or black and white (just like on TV!). This is the first (and only?) time that either of these Doctors have been made available. Today we’ve got the first Doctor as portrayed by William Hartnell. I’m not going to waste any time here, I love this figure. The sculpt is top notch, the deco perfect. My only complaint is that its difficult to get him to do anything useful with his walking stick. Seriously, the figure is that good that I can only complain about his stick. After the jump, more pics!